Features black snaps, laced sides and 2 front pockets. 20.5" 21.5" 22.5" 23.5" 24.5" 25.5" 26.5"
Is real STITCHED TOGETHER LEATHER and not as shown in the photo. I am gonna make a TopHat out of it because it's so thin I can handsew it. ----------------------------------Leather Dome Response: Sorry, pig skin is thinner than cow skin, but we updated the description so it says it is thin and light weight. The patchwork seams are visible in the photos though. Patchwork leather is made from leather scraps sewn together which is why the price is so low. 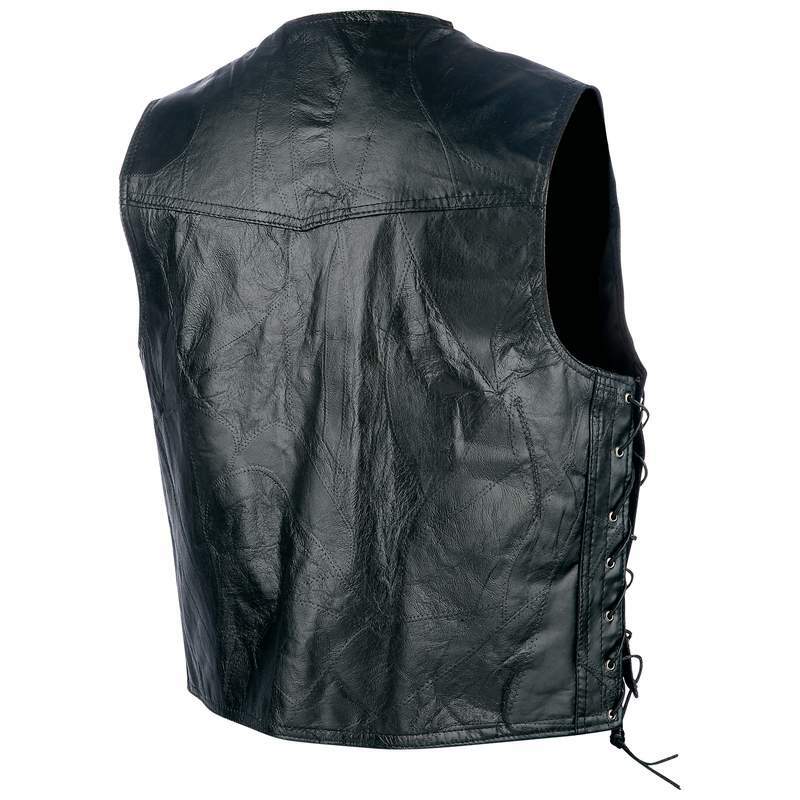 I would agree with another review that the vest runs a bit small, the leather is very soft and thin. But hey for the price point it will serve its purpose. I wanted a leather vest to ride with now. I’ll spend $120 later when I want to patch it up and keep long term. 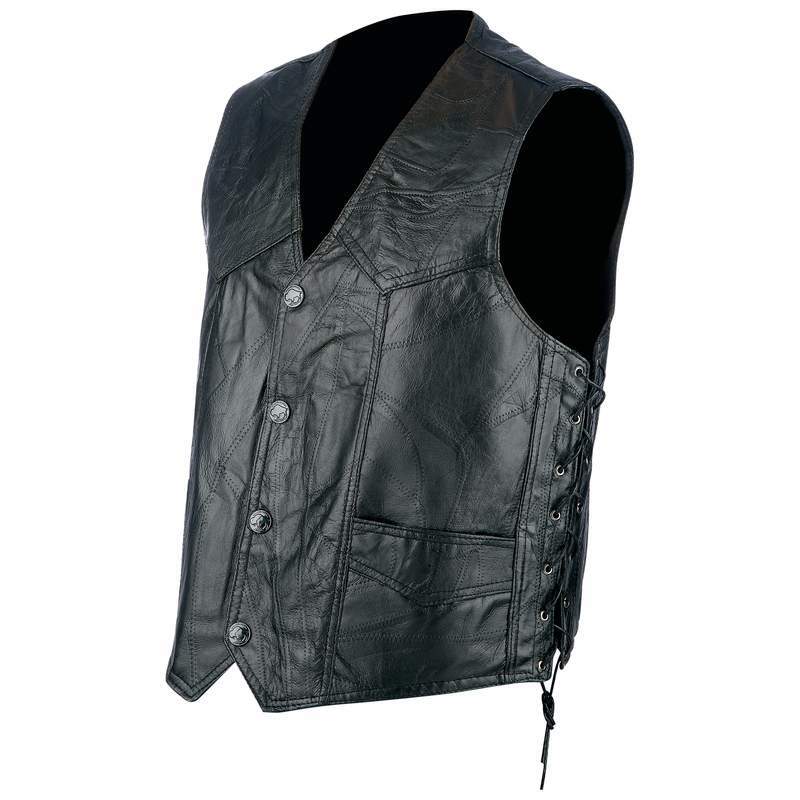 This hog leather vest is ultra soft, but runs small so order larger. Excellent value for the price! A: For the main 48 states standard shipping is $7.99, or $9.99 for Hawaii and Alaska. Orders of $50 or more ship for free to the US. A: Just go to your cart, and click the x next to any items to remove them. Or you can change quantity to 0 and click on "update." Sorry cart's are stored in your browser on your device so I can't remove them for you.